Remember when I said I wouldn’t travel for the entire month of July, just to see if I could do it? As with the majority of resolutions I‘ve made, when unexpectedly faced with the temptation or habit I want to break, I forget the promise I made to myself and blindly grab at whatever it is I swore off in the first place. (Here’s looking at you, Snickers.) I didn’t hesitate on Thursday afternoon when colleague Knuckles said, “You should go to Chicago for the BlogHer conference this weekend. Book a flight.” I might have fist-pumped. It had been like, weeks since I’d been on a plane, and I was antsy. By the time I left work on Thursday, my weekend plan had evolved from reading lazily in the neighborhood park to attending conferences all day Saturday and Sunday in the Windy City. You may be wondering why anyone would give up a perfectly lovely weekend for two days of conferences. There are two reasons I was willing (and actually really excited) to do it. 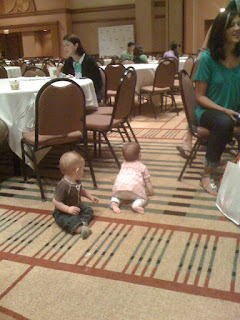 First, BlogHer is the blog conference to end all blog conferences, and despite deciding to attend after it had begun, I managed to score a pass from some colleagues and made it in to check it out for myself. 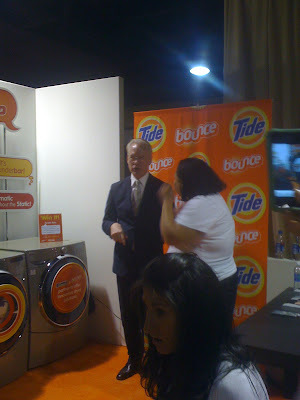 After spending Saturday checking out a variety of panels, tradeshow-like booths and speakers, I determined that BlogHer didn’t hold much for me (aside from some pretty great swag & appearances by Tim Gunn & Paula Deen) because the majority of writers there were Mommie Bloggers. I can hardly keep up with my own self, much less a passel of younguns – so that whole Mommie angle is lost on me for now. 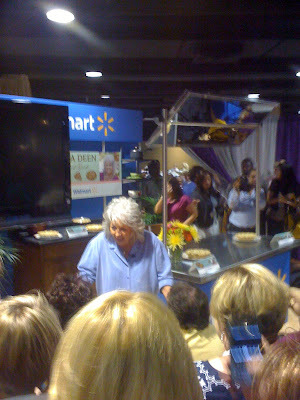 On Sunday however, there was a travel blogger conference that was much more intimate and interesting. I won’t bore you with deets, but it was totally worth the trip. The other reason (and this is not news to you) is that I just can’t get enough of going. Even though flying in particular often leaves me stranded, hurts my neck and spoils my diet, I have insatiable wanderlust. While the conferences left me with no time for sightseeing, somewhat providentially my flight was cancelled on Sunday night so I was able to visit the Sears Tower and the brand new additions to its SkyDeck. 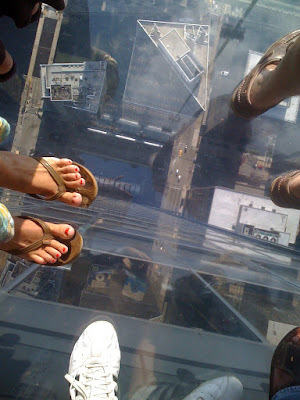 Thanks to the Passport to Chicago booklet I received in my conference swag bag, I was escorted to the elevator at the front of the hour-long line and was zoomed up to the observation deck in about 60 seconds. Huzzah. 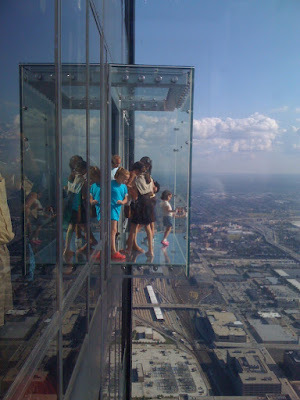 This new attraction was not scary to me, but there were visitors who I couldn’t have paid to step out onto the glass. Statistically I think you’re more likely to be killed from a donkey kick to the face, if dying is what you’re afraid of. Ah well, it was worth the free price of admission, for sure. Finally, due to the cancelled flight, I was lucky enough to meet up with my cousin Erricka, her fiancé and their friend for dinner at Harry Carey’s on the Navy Pier. Even though having friends and family all over the world means you’re always missing someone somewhere, the silver lining is that there’s always someone to dine with if travel plans go awry. First, how is it that you look so fabulous all the time? Even after being stranded in Chi Town? Love the madras dress too, btw. Okay, so this post is awfully long. Just wanted to say thanks for the pictures! You are awesome!!! Seriously. You inspire me. After over a year of talking about it maybe some day I'll finally work up the nerve to start my own blog...I just don't think I'd have anything to say and no one to read it. 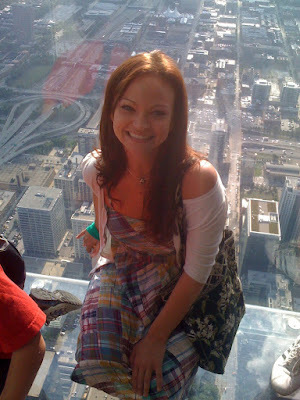 I would not step on that observation deck if you offered me a $100 bill. Seriously.